It’s not every day that Lamborghini launches a new iteration of a product. In 2012 the Lamborghini Aventador was originally introduced to the world, and in March 2017 Letizia Silvestri introduced the latest version to the interested prospects of Beverly Hills. This new model is what we now know as the Aventador S, and as Lamborghini says “An icon cannot be reinvented, it can only be challenged. And only Aventador could surpass itself.” This is how the now 740hp, V12 powered icon was born again; with 130% more downforce with the help of an exterior redesign, the new LDVA (Lamborghini Dinamica Veicolo Attiva/Lamborghini Active Vehicle Dynamics), four wheel steering, and an interior built to be different from all others. The design elements set the vehicle apart from not only past models but the competition, and this resonates with Silvestri. 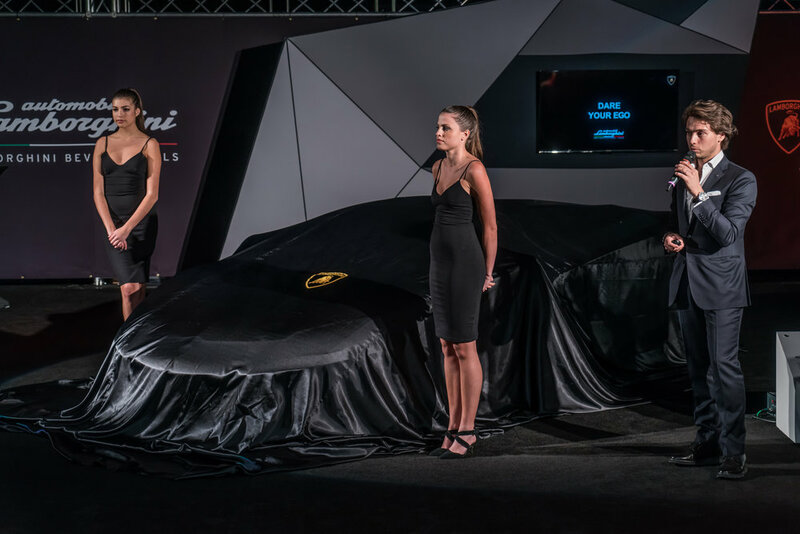 The vehicle achieving new heights along with the launch color of Giallo Orion, a Lamborghini yellow, were points of inspiration to plan an event above the rest, to look to the past and innovate; to create an unforgettable experience for O’Gara Clients. The vehicle also inspired the location. 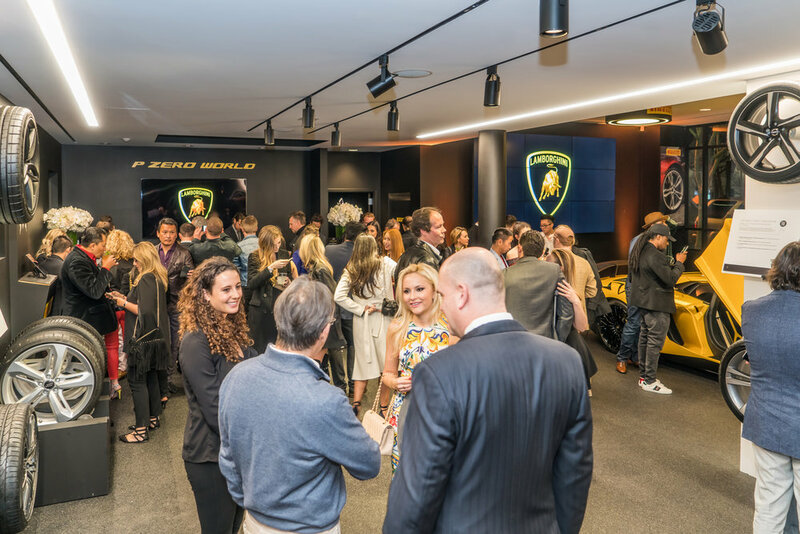 Each Aventador S would be fitted with the latest technology from Pirelli, the new generation of the P Zero tires, and recently opened near Beverly Hills was the Pirelli P Zero World. A venue built with cars in mind, also reflected the Italian heritage that Lamborghini shares, along with the black and yellow branding that suited the vehicle perfectly; not to mention the cool and sensual feeling that was created through the infamous photos from Pirelli’s past calendar models hanging on the walls, tasteful and risqué. This brand image parallels with both O’Gara and Silvestri, and was just the beginning to a long lasting relationship for co-marketing activities. Upon arriving to the showroom, guests were greeted by gorgeous models in black cocktail dresses with a sleek styling of hair pulled back with a dramatic smoky eye, requested by Silvestri provided by Runway Waiters. The ladies offered the clients a Lamborghini Beverly Hills cocktail to enjoy while taking a look at the current product line including an Huracan, and the Aventador SV in traditional Lamborghini Yellow to compliment the Pirelli branding, and an Huracan Super Trofeo Evo to feature an additional Pirelli product that is not often seen, racing tires. Guests could make also their appearance on the step and repeat before stopping at the bar decorated with florals from Tic Tock Couture and drinks conspired by Silvestri and creative partner, The Grand Bevy. Signature drinks included the V12, a very Italian drink featuring Aperol and the P Zero also Italian featuring Amaro all served with Lamborghini Beverly Hills branded napkins. Also available were black molecular spheres decorated with flakes of edible gold, an edible alcohol infused delight. 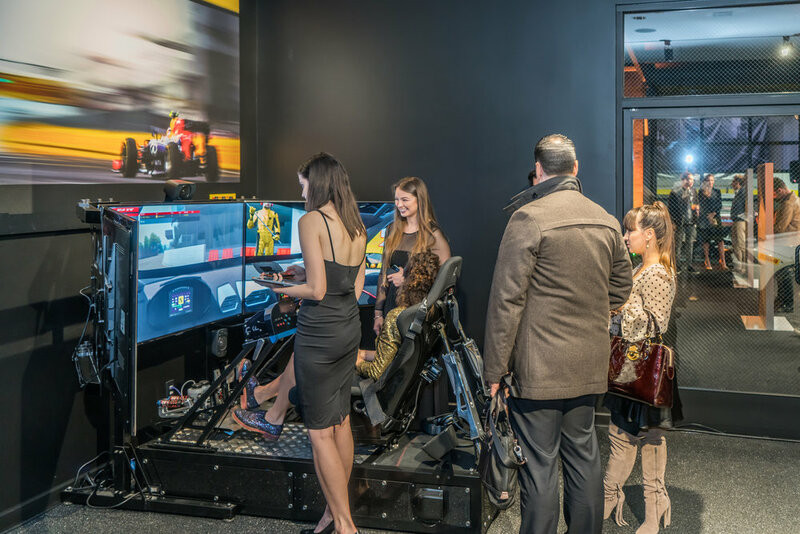 To entertain guests, O’Gara had setup their professional race simulator and created a championship series for the night, and offered the winning client an Huracan for a weekend of their choice. But what guests didn’t know, was that there was a racer driver among them. Lamborghini Brand Manager, and Super Trofeo World Champion Edoardo Piscopo. DJ Sandra Luesse had finally asked guests to make their way towards the back courtyard, and models had led the way with open doors. 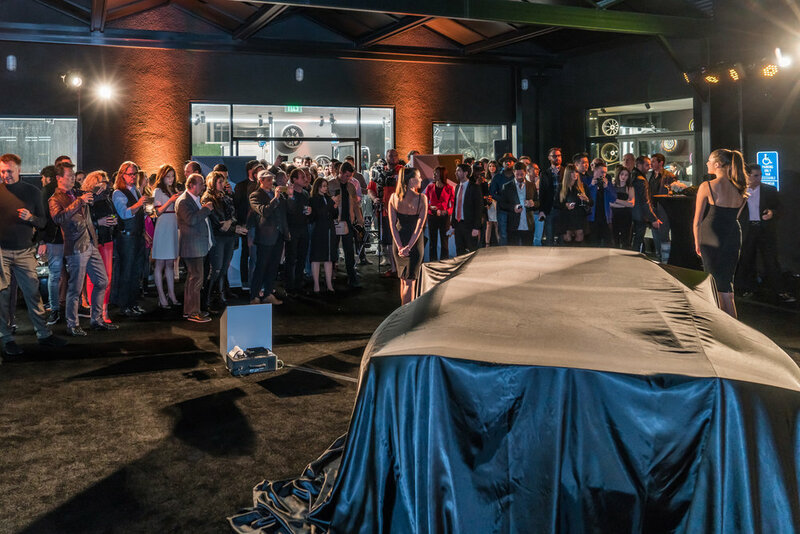 This was the first time that guests were seeing the space that by day serves as parking and an entrance to the service bay for tire changes, but on that night, the space set the stage for the latest Lamborghini Aventador S. Before the night had started, Silvestri was challenged with leveling out back area, to create a stage for a dynamic reveal. To do this she had the help of creative partner Red Carpet Systems who brought her vision together. 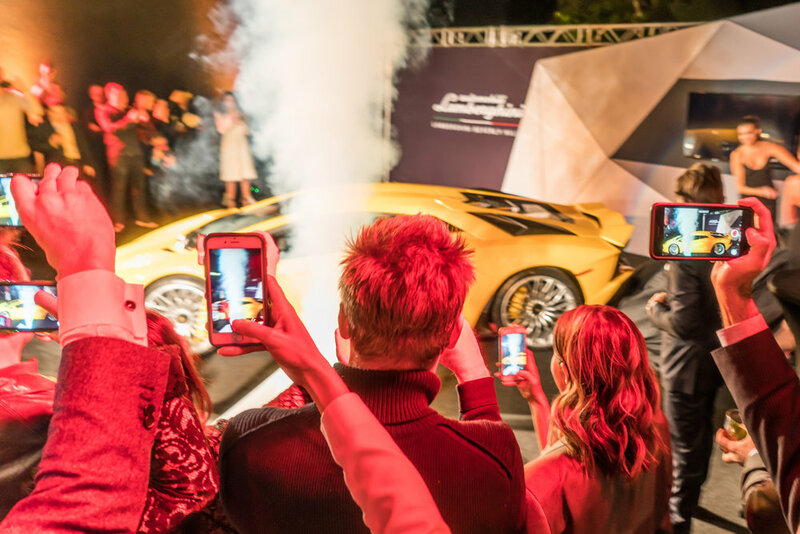 Not only were they able to redesign the venue, they brought lighting for laser installment, a smoke machine to add drama and suspense, and were also assisted with the branding materials and structure Lamborghini had built for the traveling vehicle. While Piscopo was giving the crowd the details behind what to expect from a design standpoint and power, the floor began to flood with smoke, and the music grew in the background. The time had come, and the slip was pulled from the vehicle, and brought the smoke rising with it. This effect is a favorite of Silvestri’s. Over time she had come to realize that depending on the type of fog, placement of the machine (near the rear of the vehicle) and venue size, would create an effect. The smoke rises with the slip and so does a final feeling of anticipation and excitement for the customers, a truly climatic night. Photo source: Lamborghini Beverly Hills Website.